A fierce winter storm on Lake Superior in November of 1886 brought destruction to a number of vessels around the Great Lakes, one of them was the schooner Lucern. On November 15 she loaded about 1,300 tons of iron ore at Ashland, Wisconsin for Tutle & Ogleby in Cincinnati, Ohio and departed. All reports say that the weather was fine that day and there was no indication of what was about to happen. By Nov. 16 the storm had hit, Lucerne was sighted off Ontonagon, Michigan by the steam barge Fred Kelly, but they were apparently not in a position to be able to help, they later said all they could do was watch and pray that Lucerne would make port. 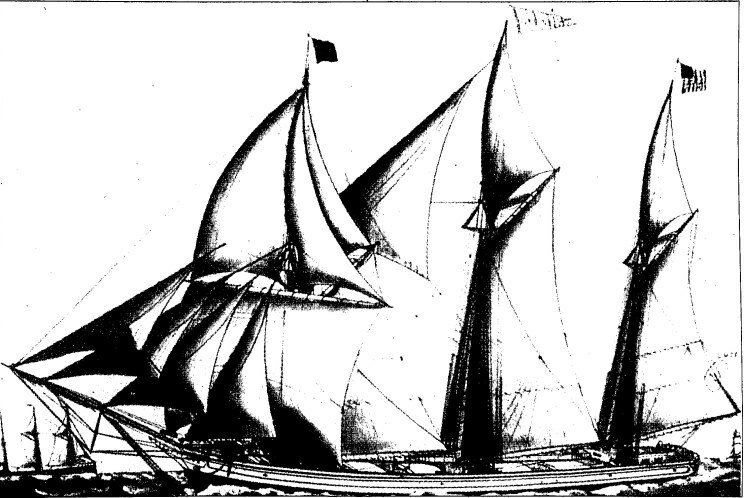 The ship had turned around and was being battered by the wind and waves, several of the sails were torn, but captain George Lloyd was able to make it almost to the shelter of Chequamegon Bay, Wisconsin. For reasons unknown he was not able to make it around Long Island at the entrance to the bay, he anchored just off the island near the lighthouse and tried to ride out the storm. Sometime during the night of November 17/18, 1886 the storm, snow and freezing temperatures took the full measure against the Lucerne and the nine men aboard. It was not until daylight on Nov. 18 (or 19th) that the ship was seen by a lighthouse keeper. By then only the top of two masts were visible, the third mast was gone, and no crewmen were found. On closer inspection the keeper saw three men in the rigging, when the bodies were removed they had been incased in up to six inches of ice. To the best of my knowledge none of the other bodies were ever recovered. Lucerne was but one of many ships either sunk or wrecked during the dreadful storm, the Witch of November has been a long time enemy of the Great Lakes mariner, and the storms of 1886 were a perfect example of why these storms were so feared.